Norman finishes his Grand Championship!! Thanks Robin! Norman has been a delight to show, with his endless enthusiasm. 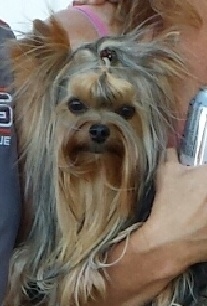 He is sired by "Trio's Big Shot" (Billy) the #1 yorkshire terrier. He has his dad's gorgeous face and beautiful steel blue color. He has already won Best Junior Sweeps at several specialities. We are excited to watch him develop. Norman is currently in S. Carolina. Norman is available for stud to approved girls.